As someone who needed glasses in first grade, wore contact lenses from age 15, had my vision corrected surgically in my late thirties, and now wears bifocal glasses, I'm very aware of what poor vision is all about. 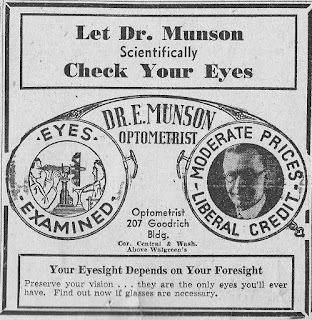 And of course when I think of old-time Phoenix I wonder what it would have been like to have poor vision. I suppose that it would have been like everything else - some people would never have the need for vision correction, the way that some people don't get cavities in their teeth, or need a doctor. Of course, if you needed it in old-time Phoenix it was available, but it would depend on if you could afford it. My best guess is that people who couldn't afford glasses just squinted, the way that people who couldn't afford dental work just pulled their teeth out. Old photos really aren't a good gauge for seeing how common wearing glasses was. I know that my mom wore glasses from the time that she was a little kid, and always took them off when she had her photo taken. Presumably most people did that. I suppose some still do. And movies don't seem to help much. Unless it's meant to emphasize age, or to be humorous, I rarely see anyone wearing glasses. I can't but help noticing if someone is driving a car and glancing at a map without glasses, if they have grey hair. I know it's "just a movie". Perhaps the suspense would be spoiled if they fished out their reading glasses or tipped their head to use their bifocals. Still, with everything else being historically accurate in the movie, that would be a nice touch. Of course one way to determine if someone has excellent vision is to see them shoot. Rifles can shoot a long way, and they only will hit their target if the shooter can see what he's shooting at. 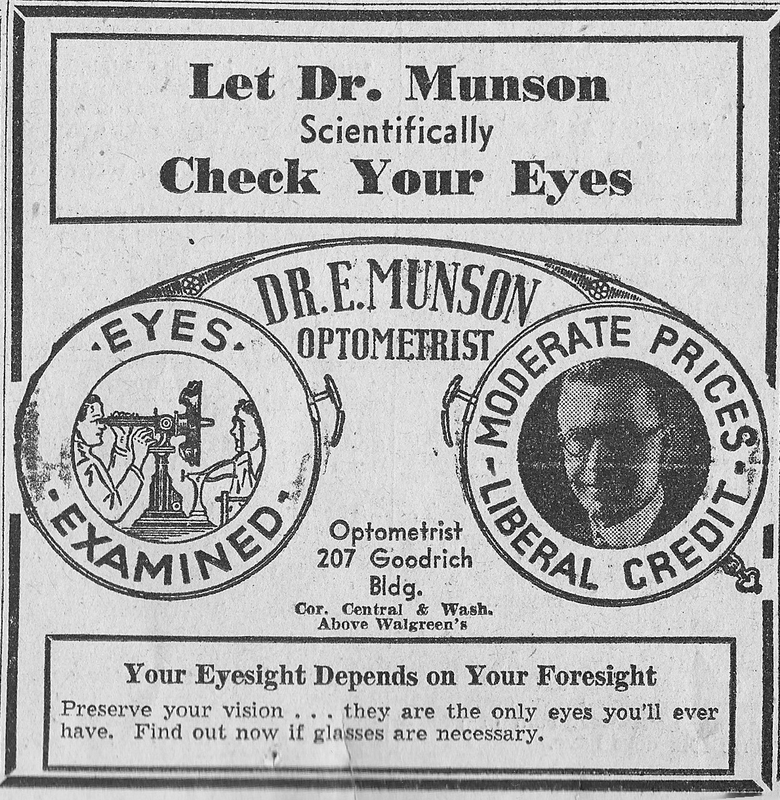 Image at the top of this post: 1942 ad for Dr. E. Munson Optometrist, 207 Goodrich Building (northwest corner of Central and Washington), Phoenix, Arizona.